Q Why cant I obtain a Portable Oxygen Concentrator from the NHS to take abroad? A The Domicillary Oxygen Contract Providers will not allow you to take any Concentrator outside of the UK or to a location that is not your permanent home address. Q Do I have to have a prescription to purchase an Oxygen Concentrator from The Oxygen Store? A No, but as a reputable supplier we will always ensure that you are under medical supervision before we will sell an Oxygen Concentrator to you. Q What is the difference between Pulse Dose Flow and Continous Flow on a Portable Oxygen Concentrator? On Pulse Dose Flow, the oxygen will be released when the machine detects your breath rather than Continuous Flow where the machine would constantly release oxygen whether someone is using the machine or not. Having the machine on Pulse Dose Flow can save a lot of battery but unfortunately not everyone has a strong enough breath to use it. Q Which Oxygen Concentrators am I allowed to take on an airplane? You can find the list of all approved Portable Oxygen Concentrators on the FAA website although all machines we supply are FAA approved. .
Q I use my Oxygen Concentrator in a smoking environment, is this something which can affect my health? You should not be using oxygen whilst smoking or in any kind of smoking environment, oxygen whilst not being flammable itself, is an accelerant towards fire. .
Q Do the Oxygen Concentrators come with any warranty? All of the Medical and Portable Oxygen Concentrators we supply come with a 3 year warranty besides the Inogen One range which still has a 3 year warranty but the sieve beds and battery on the machine is reduced to 1 year. You can even upgrade the warranty to 5 years on certain machines. Once this warranty runs out, we can still service the machine and send it off to the manufacturers for repairs but we would have to charge. Q How do I know if my Oxygen Concentrator is delivering oxygen at the correct purity? If you are using a Medical Oxygen Concentrator supplied by The Oxygen Store, all of the Medical products listed on our site have an inbuilt purity sensor which alarms when the purity drops below a manufacturer set % purity of oxygen. Alternatively if you want to double check you can purchase an oxygen meter or check the % oxygen levels in your blood using a Pulse Oximeter. Q I see multiple machines a fraction of your prices on auction sites, why are yours so much dearer? If you want a reliable high purity machine then I would look into the most reputable brands such as Airsep, DevilBiss, Inogen and many others found throughout our web page as all the portable machines we supply are FAA Approved, we do only supply trusted manufacturers who create high purity machines. Most concentrators which are sold on said auction sites are manufactured for incredibly cheap prices and as a result of that they are releasing 30-40% oxygen purity from the machine for the majority of the time. Q I have a 10 hour flight and require 2LPM Continuous Flow and I cannot find a machine which provides the needed battery life, what can I do? We can provide additional batteries with our Oxygen Concentrator Hires so that you can have another for your flight but you may need to keep in mind the rule of 150% of required battery life to cover for any flight delays!. Q I don't like using nasal cannula, can I use an oxygen mask with a portable Oxygen Concentrator? A You can only use a mask with a continuous flow Oxygen Concentrator, this could be a static Concentrator, or a Portable Oxygen Concentrator with a constant flow setting, such has a Sequal Eclipse, Equinox, GCE Zen-O or a Devilbiss Igo. Q What is the maximum length of tubing I can use with a Oxygen Concentrator? The maximum length of tubing can vary from machine to machine due to the pressure output. On static machines such as the VisionAire 5 it is not recommended to exceed 50 feet of tubing with a 7 foot cannula or mask. On Portable machines which only deliver Pulse Dose Flow, it is only recommended to have the length of the cannula or mask you are using e.g 7 foot. Of course this can change massively with industrial grade machines or smaller machines so it is always best to check the specifications of your machine to make sure you are not exceeding the recommended tubing length. .
Q Can I use a mask with my Portable Oxygen Concentrator? You cannot use a mask with any of the Pulse Dose machines as it will not be able to detect your breath, the only time you can use a mask on a portable concentrator is if the machine has a continuous flow setting and it is currently being used. .
Q Which is the better delivery method of oxygen, a cannula or a mask? This would mainly come down to personal preference of which you would find gives you more comfort. You can get high flow models of either a cannula or a mask so the flow rate is not normally an issue. We do also offer an alternate delivery method with the OxyArm which would include wearing a headset with the oxygen being released from an adjustable arm. .
Q I have a medical condition, do I still have to pay VAT? If you are a UK Resident and have a medical condition, you can fill out a VAT Exemption form and self declare VAT Exemption. Please note that this is for medical products only. .
Q I am a VAT registered business owner, do I still have to pay VAT? If you order as a business and your company is not based in the UK but inside the EU, you will have to fill out your VAT Number when ordering and we can refund the VAT. Q I reside outside of the EU and I am looking at purchasing some of your products, would it be possible to become VAT Exempt? For customers who order/deliver to countries outside the EU do not have to pay VAT although clearance duties and fees would be your responsibility and you may have to pay an additional postage rate depending on the country. Please contact us for our International shipping rates as they would vary from product to product. Q I am currently on holiday in the UK, I am from outside the EU and have just purchased an oxygen concentrator from you, how do I claim the VAT back? We can supply you with a EU VAT Exemption form which would be filled out and completed by ourselves, completed by you and then stamped at customs when you leave the UK. We would require an admin fee of £25 for this service. .
Q I have just received the can but it feels completely empty? What can you do about this? 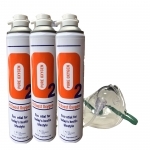 All of our cans will feel empty and be almost weightless and it is a compressed gas so as soon as the nozzle is pushed, the oxygen will be released. .
Q I have COPD and I feel like my condition is deteriorating, is this what I should be buying? If you have a medical condition, I would strongly recommend looking into purchasing an Oxygen Concentrator as in the long run it may save you a lot of money although we would always recommend you speak to your doctor or GP beforehand. All the Concentrators we supply are medically approved whereas the cans are 99.9% Breathing Grade Oxygen. Q What are the main purposes of the oxygen can? The can will increase the percentage in your blood which can help with a wide variety of things such as headaches, tiredness, sports performance, altitude sickness and a whole range of other matters. Q What is the difference between this product and the air? Oxygen levels in the air are generally 21% whereas in the cans the purity levels are 99.9%. Q Would it be okay to take some of these cans on an airplane? It would not be possible to take as the cans as there is a strict hazardous goods policy for the majority of the airlines. Q Do I need to buy a new mask with every can I purchase? No, once you have purchased a can and mask, if you are happy to re use the mask then you can attach the mask to our 'Replacement' can. Q Can I claim VAT Exemption for your can and mask product? Unfortunately this would not be possible unless you were as the can is not classified as a medical product.